Service options include: personal care; domestic assistance; respite care; social interaction; transport; medical appointments; care planning and case management. For all your postal needs and bill paying services. Photo:- Friendly service Monday to Friday. Bookings and enquiries Ph: 0412 515635 or 4982 4144. They sell at cost, a wide range of food items as well as clothing, furniture and books. Anybody holding a Centrelink card could have access to the food section. Photo:- Lesley and Richard Nash in the food section of the op-shop. All ages , all styles, men’s and ladies’ hair care and products. Ross and Julie Fitzgerald stock an extensive range of cards, magazines, stationery, computer and ink jet supplies along with a full range of Darryl Lea chocolates and confectionery. A wide range of school supplies together with Lotto and lottery tickets are available. Photo:- Ross Fitzgerald your friendly local newsagent. For all real estate sales, rentals , holiday lettings and commercial property visit our office at Kooindah or Lemon Tree Passage phone enquiries on 4984 5155. 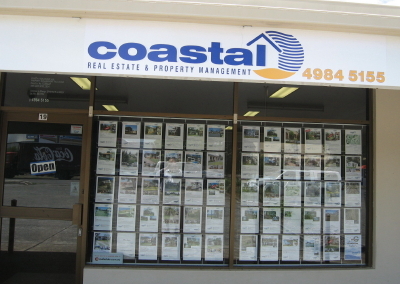 Photo:- Number one on real estate Coastal’s Office at Kooindah. For all your quality meats , small goods, raffle trays, spit roast hire and supplies. Specializing in home cured and smoked hams and bacon and award winning sausages phone 4982 4428. Photo:- The Curry Family welcomes you. For all your locally baked bread and a variety of pies, cakes and sandwiches along with milk and cold beverages phone 4984 5611. Photo:- Jill Marchant, Toni-Lee Rudder and Bec Fomm at your service. Authentic Thai meals with some 44 selections on the menu. Meet Dangkaeu and her friendly staff. All enquiries and orders Phone 4984 5838. For all ages. Includes adult fitness & flexibility. Drama, Glee Class, Cheerleading, Ballet & jazz, contemporary dance. Details & Enquiries : Tracie Tickle 0402 468 940. Surgery hours are from 8.30 am to 6.00 pm Monday to Friday. (adjacent to the medical centre).